Non-native (or exotic) species are plants and animals that were brought to an area from another region. Many of these species do not have natural predators in their new homes to keep their populations in check, and they often spread rapidly. A species that is able to invade and disrupt an ecosystem, often out-competing the native flora and fauna, in considered invasive. Other invasive plant species listed by Mass DCR’s Lakes and Ponds Program include: swollen bladderwort, European naiad, South American waterweed, yellow floating heart, and hydrilla. Potential invaders include: hygrophila, parrot feather, and zebra mussel. Organizing volunteer water chestnut hand-pulling events. Mapping and managing invasive water chestnut. Volunteer to help pull water chestnut. OARS has been working to manage water chestnut on the Assabet River since 2008, and since 2012 to map water chestnut and other invasive aquatic species in the watershed. 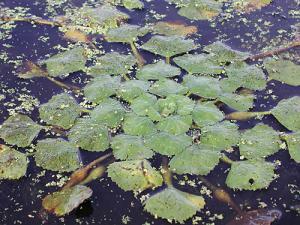 Prevent the introduction of invasives: The International Waterlily & Water Gardening Society also compiles a comprehensive list of state-regulated invasive aquatic plants. Check the IWWGS and Mass. List of Prohibited Plants before buying any plant for water gardening, and never release non-native plants to our local ecosystem. • Remove all plants and animals from boat, trailer, anchors, fishing gear and diving gear. • Flush engines and dispose of bait, bilge water and bait bucket water on land away from shore. • Never release any plant or animal into a body of water, unless it came out of that water. • Dispose of all foreign matter far from water. • Always check your boat, trailer and gear before entering or leaving a waterbody.